The first person of European descent to settle in the Brunswick area was Mark Carr, a captain in General James Oglethorpe’s Marine Boat Company. As early as 1738, Carr had established his plantation on a thousand acres along the Turtle River. In 1771, the Royal Province of Georgia bought Carr’s land and laid out the town of Brunswick in the grid style following Oglethorpe’s plan for Savannah, located just 75 miles north. By the late 19th century, Brunswick had become a small but significant port city, rivaling Savannah. Lumber, cotton, indigo, rice, and fruit were shipped from its docks. Its commercial role attracted a number of merchants, including Jews who developed a small, but strong, community. Temple Beth Tefilloh Photo courtesy of Julian Preisler. It’s unclear when the first Jews settled in Brunswick, but its Jewish population began to grow after the Civil War. Jacob Lessner, an immigrant from Poland, was a merchant in Brunswick in 1860, living with his wife Minnie and newborn child. In 1878, Jacob Michelson, a prominent Prussian-born merchant, brought the small number of Jews in Brunswick together to celebrate the High Holidays for the first time in the city. While these early informal prayer gatherings likely took place in people’s homes, by the mid-1880s, the Jews in Brunswick were renting a hall from the Knights of Pythias. Savannah’s Mickve Israel provided a Torah to the Brunswick group. By July 27, 1879, a B’nai B’rith Lodge was established with 15 charter members, and, by 1881, its membership had grown to 20. Among this group were Jews from Darien since, in 1879, there were only six Jewish families in Brunswick. When David Glauber moved to Brunswick in 1886, he took the initiative to formalize the Brunswick Jewish community. Not long after arriving, Glauber convened 21 Jewish men to form Congregation Beth Tefilloh (House of Prayer) which soon worked to build a house of worship. Max Hirsch was named the congregation’s first president. A committee was appointed to raise funds from the Jews of Brunswick and the surrounding areas. Among the members of this fundraising committee were Benjamin Hirsch, David Glauber, Michelas Kaiser, H. Wechsler, and Max Ullman. By 1888, the congregation’s membership had grown to 60, with many coming from towns outside of Brunswick. In response to this growth, the group purchased a lot and established a building committee, led by Morris Michaelson. The synagogue was designed by Jewish architect Alfred Eichberg, who incorporated Moorish-style horseshoe arches in the front of the building. Temple Beth Tefilloh was dedicated on November 7, 1890. Though the congregation had both Reform and Orthodox members, Rabbi Isaac Mayer Wise, the founder of Reform Judaism in America, came to Brunswick from Cincinnati to give the keynote address at the dedication. By 1907, the congregation had joined the Union of American Hebrew Congregations. Around the same time the congregation was established, the city of Brunswick deeded a section of the newly created Palmetto Cemetery to the Jewish community for use as burial ground. By 1889, Congregation Beth Tefilloh had a rabbi, Bernhard Rabbino, who remained with the congregation for five years until a yellow fever epidemic forced him and his family to leave the area. Since Brunswick was a port town, it attracted Jewish peddlers and merchants. Benjamin Hirsch, the first president of the congregation, was a merchant who had recently immigrated to the United States. Many of his fellow congregants dealt in retail or wholesale groceries, clothing, or dry goods. Some were clerks and few were lawyers. David Glauber, who had come from Albany, Georgia, opened a business with S. Mayer. A few years later, he withdrew from the firm and Mayer formed a partnership with Max Ullman. Later on, Glauber went into the wholesale grain and provision business with Moses Isaacs, who had come from Thomasville, Georgia. One of the most notable merchants was Sig Levison, who left a lasting if unusual mark on the area. In 1890, Levison emigrated from Germany and ended up in Brunswick. Soon after, he and his son, Robert, went to St. Simons Island, one of the Golden Isles off the coast near Brunswick, and built a general store. It was a one-story building where they sold groceries, horse collars, and almost anything their customers wanted. The Levison’s business began competing with the company store of the sawmill that was a major part of the island's settlement. The Levisons tried to call their part of the settlement “Levisonton,” but this name was too long and hard to pronounce. People began to call the area “Jewtown” instead. Though Levison had to shut down his store in 1921 due to financial troubles, the largely African American community is still known today as Jewtown. The Jewish Alliance of America was established to disperse the growing concentration of Jews in northeastern cities. One early plan was to colonize a group of these Jewish immigrants on farms outside of Brunswick, where they could raise fruits, vegetables, poultry, and dairy products. The Jewish population of Brunswick would have grown substantially if this plan had come to fruition. While similar agricultural colonies were successful in places like Oregon, Colorado, New Jersey, and the Dakotas, the Brunswick plan never got off the ground. The Jewish Alliance of America did end up sending 150 Jewish immigrants to Georgia in 1891. In 1892, the women of Beth Tefilloh founded the Jewish Ladies Aid Society, which raised money for charity through elaborate parties and balls. Their annual Purim Masquerade Ball was one of the most popular social events of the year in Brunswick. On February 27, 1900, the Jewish Ladies Aid Society's Purim ball featured 300 guests, music, food, and a costume contest. Mrs. Augusta Arnheiter won the contest and was declared Queen of the Night for her outfit. J.B. Abrams, who, in a nod to the economic recession, wore only a barrel, won the gentleman’s prize, a handsome silver brush. The Jewish Ladies Aid Society later became the congregation’s Sisterhood, but continued to be involved in charitable efforts. The Sisterhood participated in numerous Red Cross projects during World War I and rendered financial aid to Jews suffering in Europe. Later, Brunswick’s Jewish women founded a chapter of the Zionist group Hadassah. As a small congregation located in a remote corner of Georgia, Beth Tefilloh had a hard time keeping a rabbi during its early years. After Rabbi Rabbino left Brunswick, Congregation Beth Tefilloh went through a series of spiritual leaders. Rabbi Isidore Warsaw led the temple in 1902 and 1903 and was followed by Rabbi Druker who only stayed for a year. Druker was succeeded by Rabbi Schreiber, who also left after a year. The congregation next hired G.H. Loewenstein, who stayed for just two years, 1909 and 1910. The synagogue then went through a period in which they did not have a full-time rabbi. The congregation would bring in visiting rabbis for the High Holidays. Throughout the early 20th century, Temple Beth Tefilloh struggled to keep its doors open, especially after the Great Depression decimated Brunswick and its port. In 1907, the congregation had 25 members, though many of these were families with young children as the religious school had 40 students at the time. By 1935, there were only ten contributing members in the congregation. This decline in membership prompted some discussion whether Brunswick’s Jewish population was large enough to support a synagogue. Despite these problems, Beth Tefilloh remained open thanks in large part to the support of the Sisterhood. The Sisterhood even purchased a new tile roof for the building which is still in place today. Beth Tefilloh’s struggles were worsened by religious divisions within the local Jewish community. When a growing number of Eastern European Jews settled in Brunswick, they formed their own Orthodox congregation, Agudath Israel, in 1919. This group was formed out of the Brunswick Hebrew Association, a charity organization established in 1907 to help newly arrived Jewish immigrants. When Agudath Israel was founded, it had 28 member families, as compared to Beth Tefilloh’s 30 member families in 1919. Agudath Israel even had a small religious school, which met daily and had 15 students. Agudath Israel’s first president, Nathan Zelmenovitz, who owned a wholesale grocery business, was a Russian immigrant like most of Agudath Israel’s members. During the 1920s, neither congregation had a full-time rabbi. During the High Holidays, both would bring in visiting clergy to lead services. Brunswick Jews soon realized the absurdity of two small and struggling congregations each paying to bring in their own rabbi, and they began to pool their efforts. By 1927, the members of Beth Tefilloh agreed that any rabbi they hired for the High Holidays would be “suitable to both congregations.” Soon after, leaders of the two congregations negotiated a merger, though it is clear which group had the upper hand since the merged congregation retained the name Beth Tefilloh. The islands around Brunswick became known as “the winter Newport,” attracting the eastern elite seeking to vacation away from the cold. The hotels that catered to them, like those in the Northeast, usually did not welcome Jewish guests. 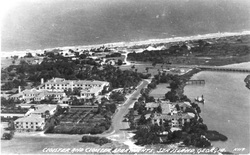 For example, in 1928, Bill Jones and automobile magnate Howard Coffin created “a friendly little hotel” on Sea Island called the Cloister. It was considered a five-star hotel and George H. W. Bush and Barbara Bush even visited there for their honeymoon in 1945. However, the hotel did not allow Jews or African Americans until after the civil rights movement of the 1960s. Later, the King and Prince Hotel on St. Simons Island became a popular dance club, but some suggest it was originally built in the 1930s as a Jewish alternative to the Cloister. World War II brought an economic resurgence to Brunswick, in the form of 99 “Liberty Ships” produced at the local J.A. Jones Construction Company. The ship building company hired thousands of workers which led to bustling business in the town’s stores.Beth Tefilloh benefited as well, growing from ten contributing members in 1940 to 50 in 1945, with several members coming from other towns, including Darien and Jesup. In 1943, this growth in membership brought about an expanded budget, as well as the reestablishment of the religious school and regular Shabbat services. The members of Beth Tefilloh were active on the homefront, with the Sisterhood devoting its full effort to bandage making, blanket knitting, airplane spotting, aiding the Red Cross, and serving as hostesses at the USO. A service flag was displayed inside the synagogue for each member of the congregation fighting in the war. World War II helped bring about a surge in manufacturing in the Brunswick area. During the 1930s and 1940s, several local manufacturing plants were owned and operated by members of Brunswick’s Jewish community. One such person, Bob Pascal, opened up a shirt factory in nearby Jesup, Georgia. The factory, which was called “Sea Island Shirts,” operated through the war and into the 1960s. Pascal only employed women in his plant but arranged for a furniture factory to come to town to provide employment for the men. Pascal also built housing for his female work force. Most famously, shirts that were made in Pascal’s factory were worn by Elvis Presley and even mentioned in the original James Bond books. The factory has since closed down, but, for years afterward, the town held a “Bob Pascal Day” in his honor. With their increase in membership during the war, Beth Tefilloh was able to once again hire a full-time rabbi. Rabbi Joseph B. Messing led the congregation in 1944 and 1945. For the next several years, the congregation had a series of rabbis, none of whom stayed more than a few years. These rabbis included Bernhard C. Ehrenreich, Tibor Fabian, Joseph Spear, Milton Greenwald, Moshay Mann, Benjamin Schultz, and Milton Greenwald. In 1949, Beth Tefilloh dedicated a new recreation center that housed the religious school and other activities. Fred Pfeiffer, the only surviving member of the original 1886 congregation, broke the ground for the addition. Pfeiffer had been a young man when the original temple was built, but became an active member and served as secretary of the congregation from 1909 until the 1940s. As the congregation celebrated its 75th anniversary in 1961, Beth Tefilloh remained a vibrant center of Jewish life in Brunswick. That year, there were five b'nei mitzvah, six confirmants, and 12 members of the youth group. Since World War II, the Jewish community of Brunswick has fluctuated greatly in size. In 1968, the community reached a historic peak of 230 Jews, but by 1984, it had declined to 120. Beth Tefilloh’s membership fluctuated as well, shifting between 20 and 35 members over the years. Despite the congregation’s small size, it continued to attract rabbis, several of whom were retired and were attracted to the weather and quality of life in Brunswick. Among the rabbis who have been in the pulpit at Beth Tefilloh are Saul Rubin, Haskel Bernat, and Alvin Sugarman. The Jews in Brunswick are still largely in mercantile businesses, but have also expanded into other professions. The local Jewish community includes medical professionals, journalists, and even a radio station owner. Jews have served on the boards of local institutions and banks as well as in the local government. In 2009, Beth Tefilloh had about 36 families, including residents of the Golden Islands (St. Simons Island, Jekyll Island, Sea Island, and Little St. Simons Island) and other surrounding communities. They had eight children in their religious school. Recently, members have begun the process of listing their beautiful synagogue on the National Register of Historic Places. While Brunswick’s Jewish congregation has never been large, it has remained active for almost 125 years, and shows no signs of stopping in the near future.